Currently viewing the category: "Slide from Scratch Series"
In this installation of the Slide from Scratch, we’ll create 3 slides that will go into a Business Strategy Update Presentation. 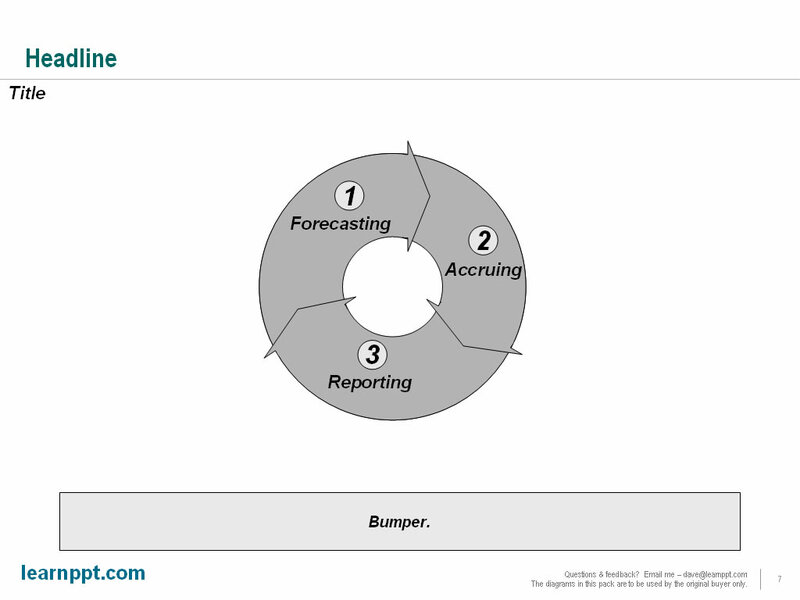 The slides will be following the Consulting Presentation Framework, where we start the slide with a Headline message and close with the Bumper. 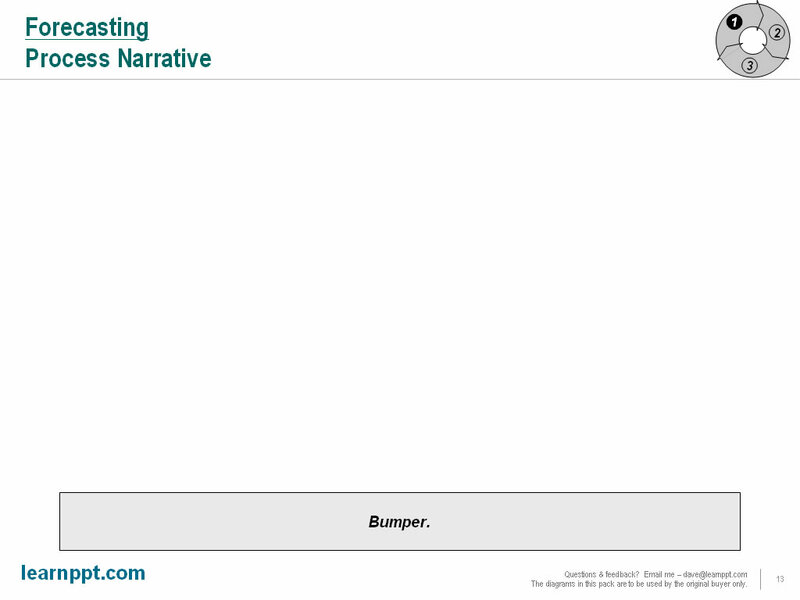 The bumper captures the key takeaway or added insight of the slide. So, here’s our hypothetical situation. Our company has already defined its strategic vision and corresponding goals for the fiscal year. 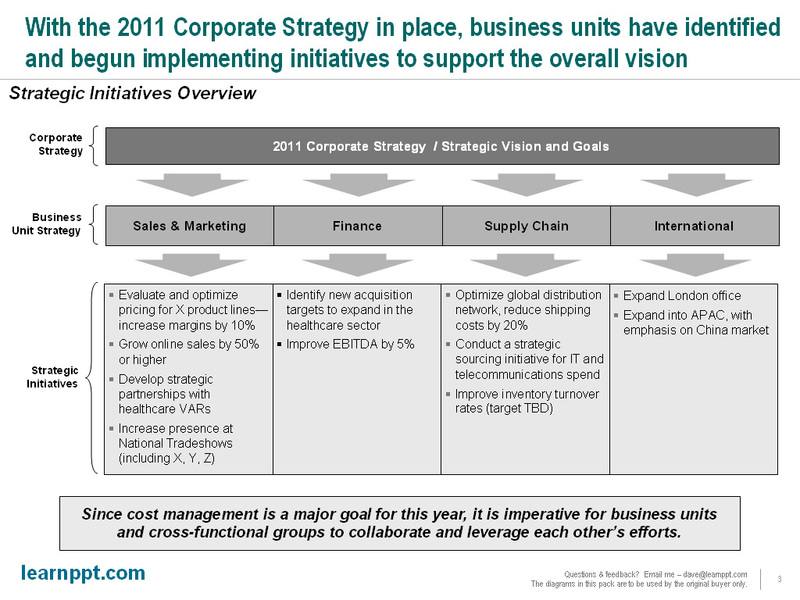 Its corporate strategy has been published and communicated out to the organization. As such, business units have defined specific strategic initiatives, supporting the company’s strategy and goals, and have begun executing them. The purpose of the business presentation we will create is to capture the business unit-level initiatives and status of these initiatives. Let’s say there are four key business units that management is most interested in: Sales & Marketing, Finance, Supply Chain, and International Business. 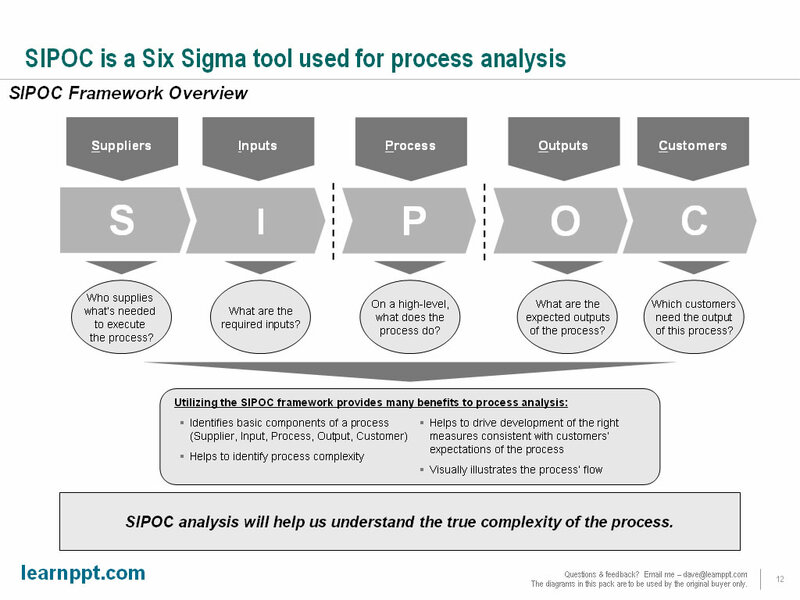 This presentation should act as a report management can print out, review, as well as distribute to others in the organization. To begin, we should have a vision in mind for a diagram that is both intuitive and comprehensive. Since strategy is driven down from the corporate level, let us create a diagram with a layered effect. An easy way to do this is just to create horizontal layers (e.g. Rectangle AutoShape, tables) separated by a series of downward pointing arrows (to illustrate the top-down flow). 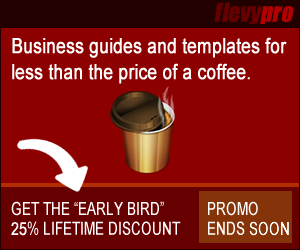 We’ll create 3 layers, labeled Corporate Strategy, Business Unit Strategy, and Strategic Initiatives. This illustrates that the overarching Corporate Strategy defines the Business Unit-level Strategy, which then define the Strategic Initiatives at the operational level. Based on our thought process, let’s lay out the first iteration of our slide. 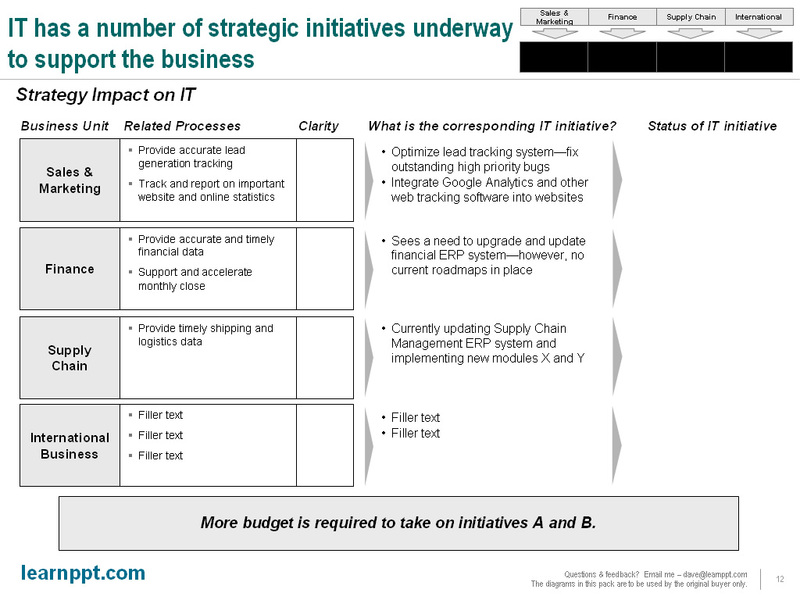 Note that for the Business Unit and Strategic Initiative layers, I’ve split each into 4 columns. This is because we will focus only on the 4 business units that management expressed the most interest in: Sales & Marketing, Finance, Supply Chain, and International Business. The top layer is created with a normal Rectangle AutoShape, while the other 2 4-columned layers are created using tables. Now, let’s fill out the text. Again, the text is all hypothetical and filler. For the strategic initiatives, I am using indented bullets with a space between paragraphs. This makes each initiative easier to read. 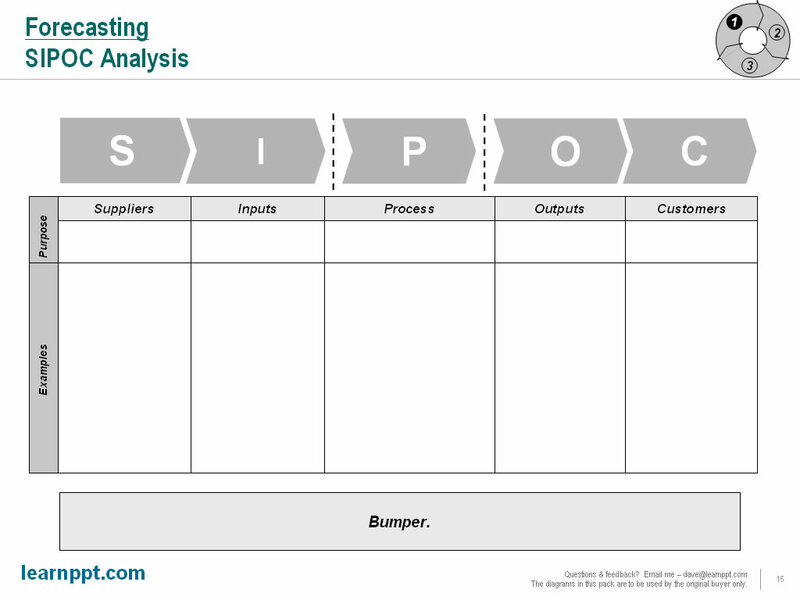 The “bumper” text (see Consulting Presentation Framework section for a refresher on this term) captures an insight that is not obvious from the rest of the slide. 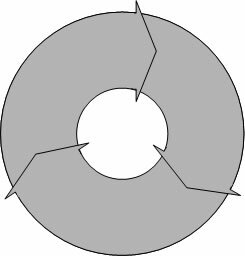 One other important observation to make is that this diagram is also very simple. Because of its simplicity, it will also make a good “tracker” to be used on future slides. The tracker is a technique we introduced in the last Slide from Series 3-Prong Marketing Strategy article. 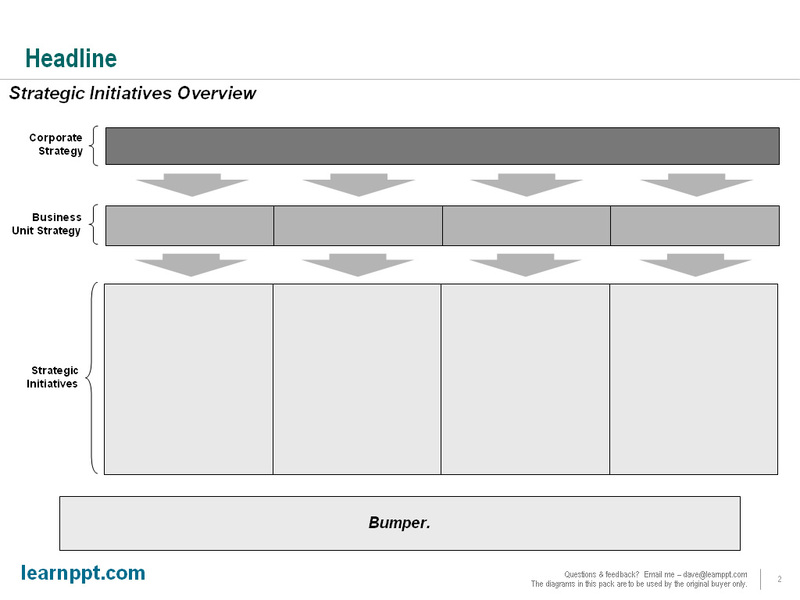 As a reminder, a tracker is an icon diagram used on multiple slides to help the audience track along the progress of the presentation. The tracker is always a smaller version of a diagram introduced earlier in the presentation. It is usually located on the top-right portion of the slide. We’ll use trackers in the next 2 slide creation walk throughs. Next, in the presentation, we want to create a series of slides that report on the statuses of the strategic initiatives. 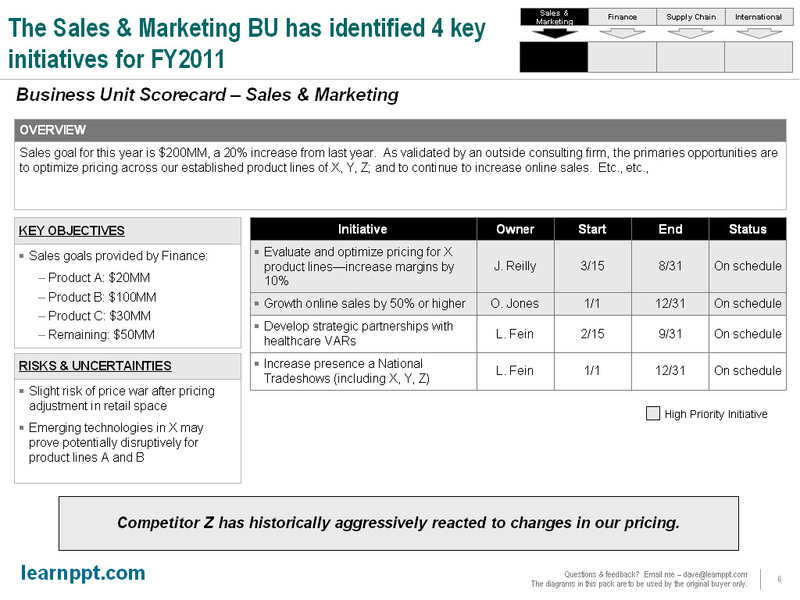 We will create 1 slide per business unit for each of the 4 main business units. Let’s call each slide a scorecard. Each scorecard will contain 4 key sections: an overview explaining the business unit-level strategy and goals, the list of initiatives with details (e.g. owner, status), a list of key objectives, and any identified risks or uncertainties. First, let’s drop in that tracker. The tracker will just be the 2 lower layers of the diagram in the overview slide, shrunken down. We will pop this in the top-right portion of the slide and highlight (i.e. shade in with a darker color) the appropriate columns. 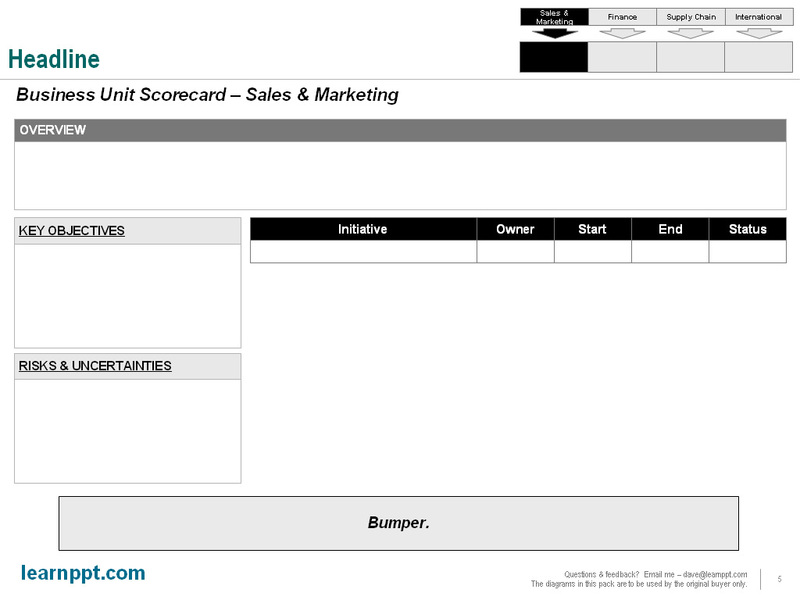 In other words, for the “Sales & Marketing” scorecard, we will highlight the first column in the tracker diagram. Here, let’s have a look. 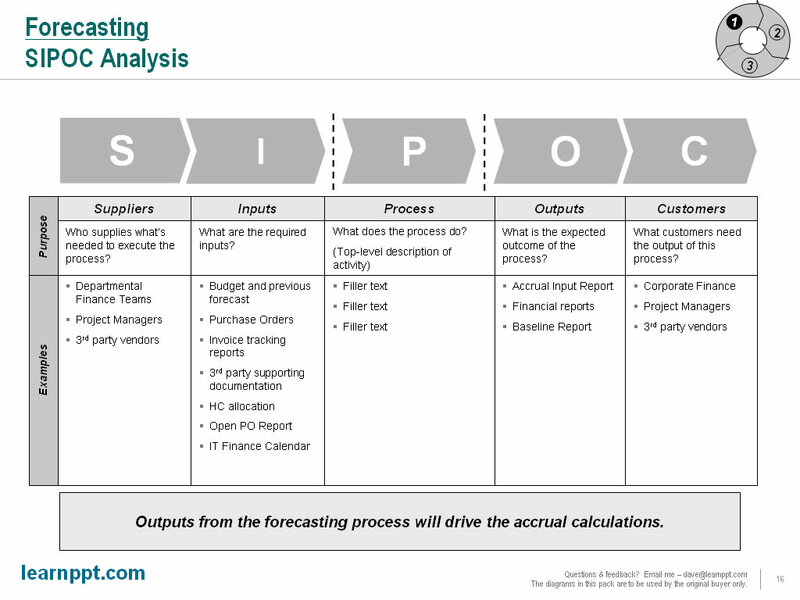 The easiest way to make a scorecard or scorecard-like slide is with tables. In our example, we will create it entirely out of tables. We will create 1 table per section. To maintain a professional and high-quality look, make sure to align the sections properly. Resize whenever you need to. Leave equal spacing between sections as well as around the margins. Remember, a nicely formatted slide is a cue for high quality. Here’s what we have now without any text yet. Now, let’s add in the meat of the content. Note that I added the embellishment of highlighting those initiatives that are considered high priority. Color coding rows is easy and intuitive. You can also additional colors for low priority and medium priority. Remember to always use a legend, like I have (under the initiative table). Another embellishment that you can also add is to color code the cells under the “status” column. For instance, if the initiative is “On schedule,” color that cell green. If it’s behind schedule, color it red. I didn’t bother to do this in our example. 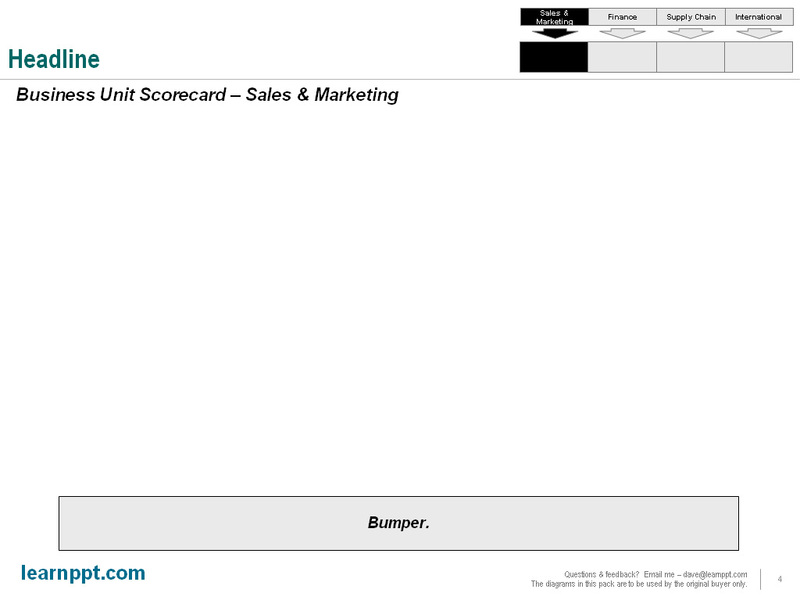 Once you have one scorecard created, you can replicate this for the 3 other business units. Remember to update the highlighting of the tracker for each slide. 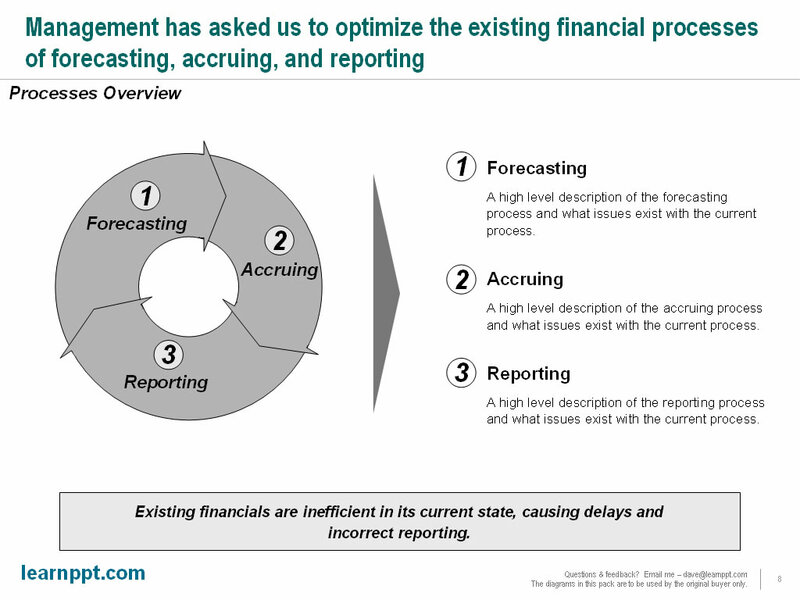 Here’s what the Finance slide would look like with the updated tracker PowerPoint diagram. Now, let’s take this one step further. We also need report on the status of supporting initiatives from important cross-functional, shared services. Let’s take IT as an example. To support many of the strategic initiatives of our primary 4 business units, IT will need to install or upgrade new technologies. 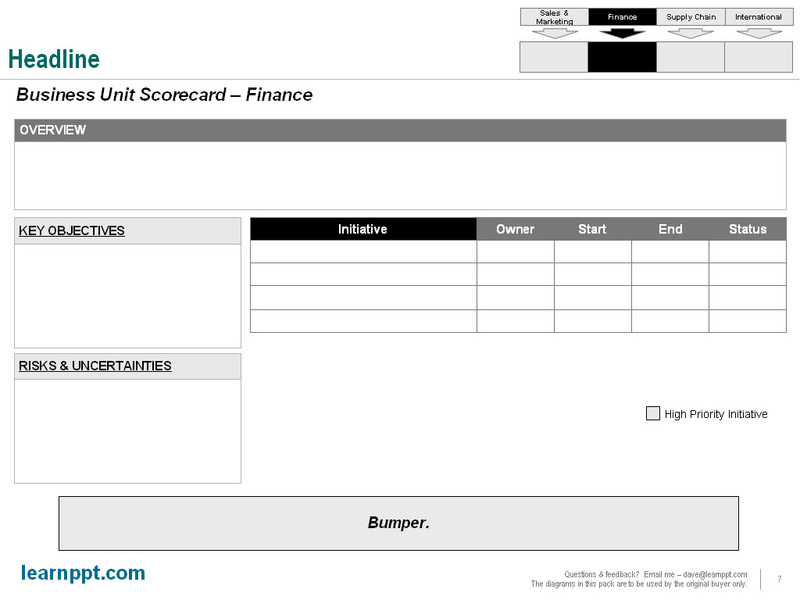 For a shared services business unit, we will design a new type of scorecard layout. We can still leverage the tracker icon. However, instead of highlighting vertically, we can highlight horizontally to illustrate the cross-functional nature of this business unit. In the case for IT, we will highlight all 4 business units. Here, let’s have a look at the updated tracker. 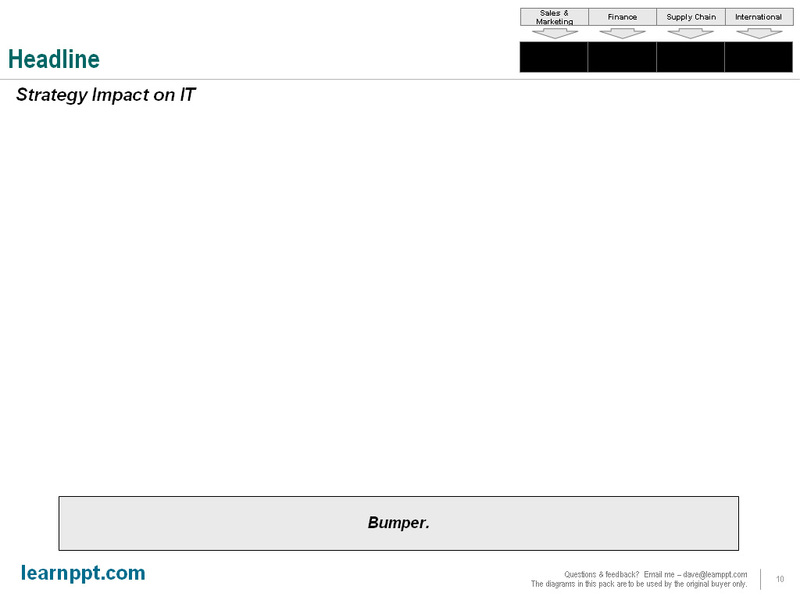 For this scorecard, we will stick to a structured matrix layout. 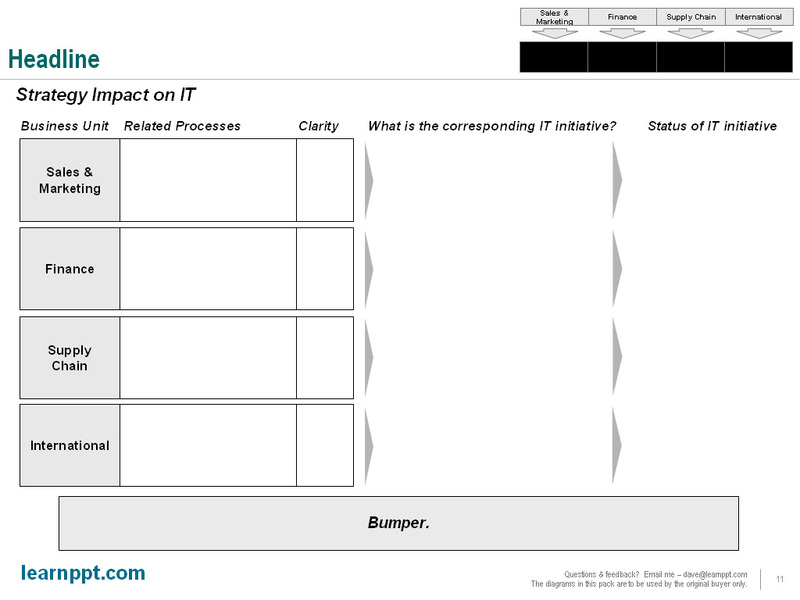 Since we need to illustrate IT’s impact on 4 business units, we will create 4 rows in our matrix layout. Each row corresponds to a business unit. Our columns will represent various components that we would like to capture. 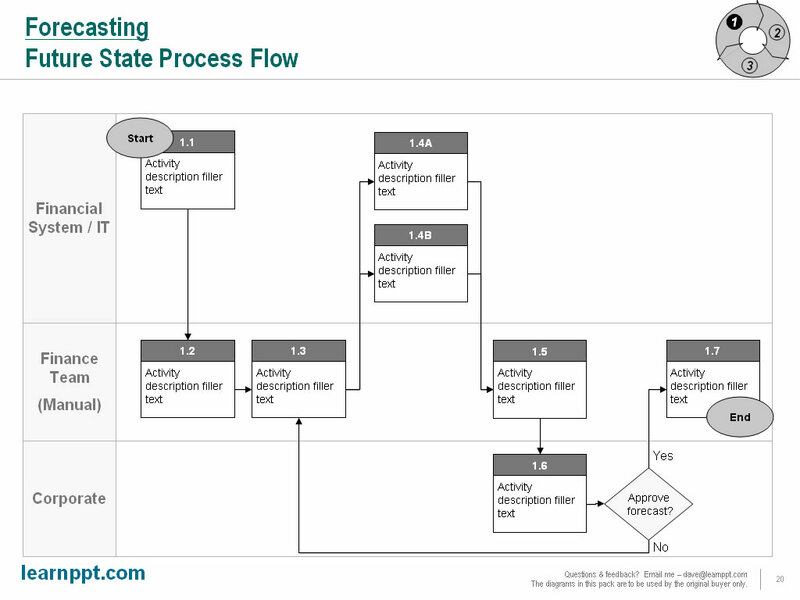 In this example, we will capture the following components: related business unit processes; clarity of process to IT; corresponding IT initiatives; and status of IT initiatives. Here’s how our matrix diagram looks. Now, let’s fill in some text. The slide, as you may have noticed, isn’t complete yet. 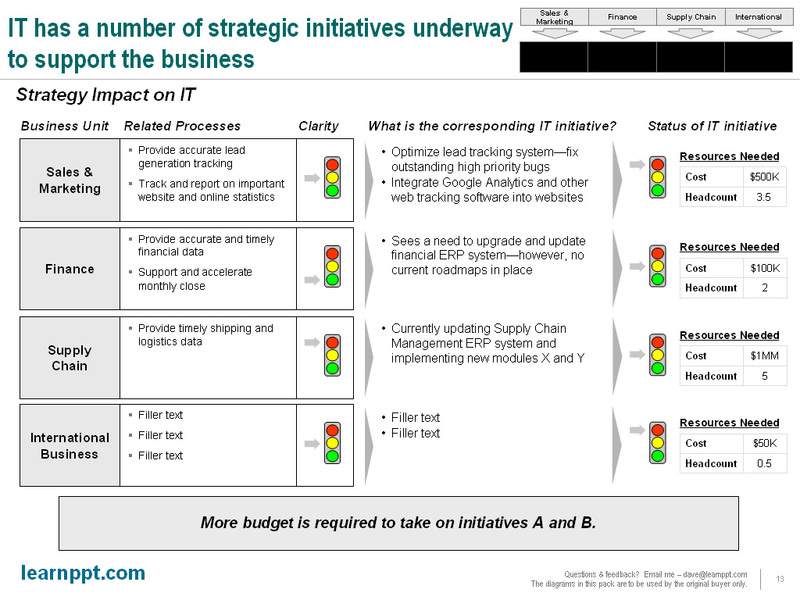 For the “Clarity” and “Status of IT initiative” columns, we can use traffic light icons. 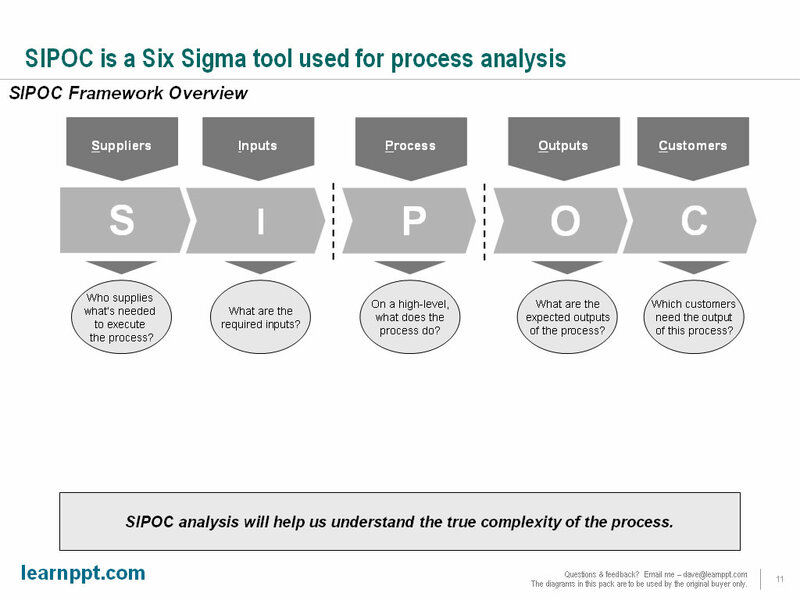 These diagrams are very popular with executives, since they’re simple and very intuitive. I have even had clients specifically request this type of diagram after seeing them used. I try to utilize them in my PowerPoint slides whenever I need to illustrate the status of anything. Of course, since Kindle diagrams appear in shades of grey, it’s not as effective here. Under “Status of It initiative,” we will also capture resource requirements. This can be done in a small 2×2 table. Let’s take a look at the finished slide. Alright, there we go! 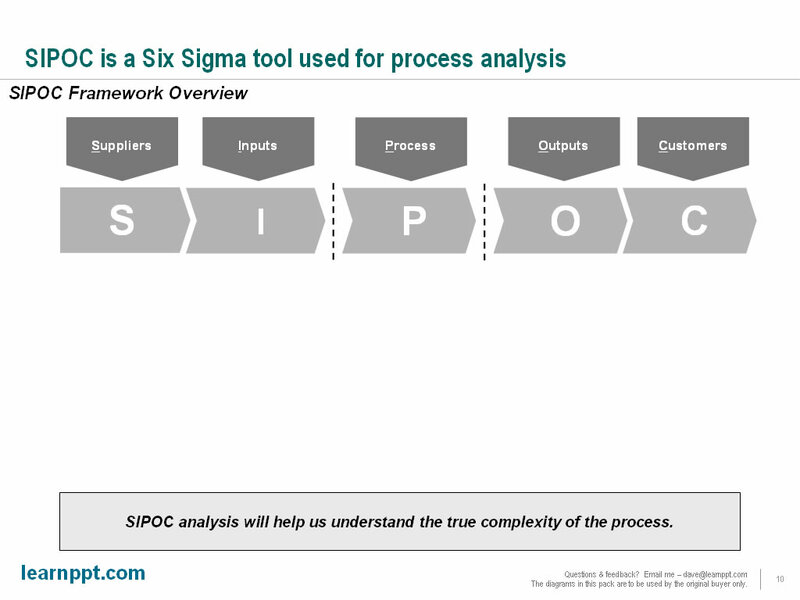 These slides can easily be customized to fit a different organization, one with different primary and supporting business units. You can download all these slides for free at LearnPPT: http://learnppt.com/downloads/strategy-update/. If your work involves or are just interested in corporate strategy development, I recommend checking out our Strategy Development Toolkit. It’s a fairly detailed 37-slide PowerPoint with topics covering key learnings borrowed from historical military strategists to the modern fundamentals of strategy development. It also describes a 3-phase approach used by top management consultants when conducting a strategy development engagement. You can download a free PowerPoint plugin called Flevy Tools that creates commonly used consulting diagrams: http://flevy.com/powerpoint-plugin. Flevy Tools allows you to dynamically generate Gantt Charts, Harvey Ball diagrams, approach diagrams, and other diagrams. For the time being, it’s a completely free download. I believe one of the best ways to learn is through example. And so, I am starting a new series on my blog, which I will be calling “Slide from Scratch.” For each of these posts, I will walk through a real example of a slide I had to create, going from initial conceptualization of just ideas to creation of the final slide. This will be the first post of the series. I will walk through creating a slide for a 3-prong marketing strategy. The success of your marketing efforts is measured on the number of leads generated, which let’s say is X leads for 2010. The marketing team has identified a whole portfolio of marketing initiatives, which fall under the encompassing marketing strategy. Lastly, the suite of marketing initiatives must be prioritized and balanced against the annual marketing budget of $X MM. Alright, so how do we begin? Looking at the information we’ve been presented with, it’s important to identify some logical flow or story through it all. The flow that I see starts with your high-level marketing strategy. Within the strategy, there are 3 core pillars, which can be further broken down into specific initiatives. The marketing strategic and corresponding initiatives will drive X leads. Visually, the slide in my mind should be structured top-down. At the top, we have the marketing strategy broken into its 3 parts. At the bottom, we have the end goal of generating X sales leads. Let’s transfer this image onto PowerPoint and see how it looks. Our next step is to fit in the rest of the information. We know we have a full portfolio of marketing initiatives that fall under the Marketing Strategy. This can be organized by the 3 pillars. However, to add more structure, we should also organize them functionally. 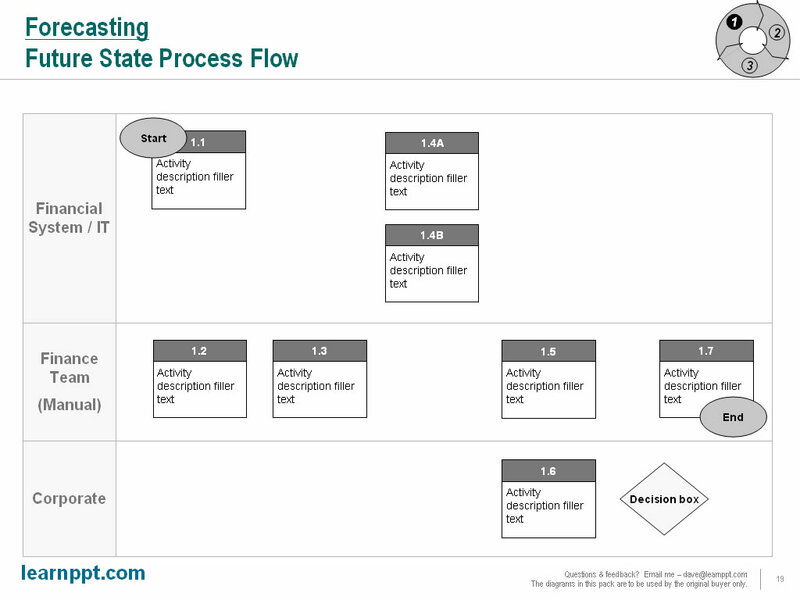 A great way to organize initiatives or any list of items under 2 dimensions is through a matrix. For the functional marketing buckets, we can rely on a basic marketing framework, the 4 Ps of marketing. Additionally, we need to capture the concept of the marketing budget. This can also be incorporate into the matrix, using the bottom rows. 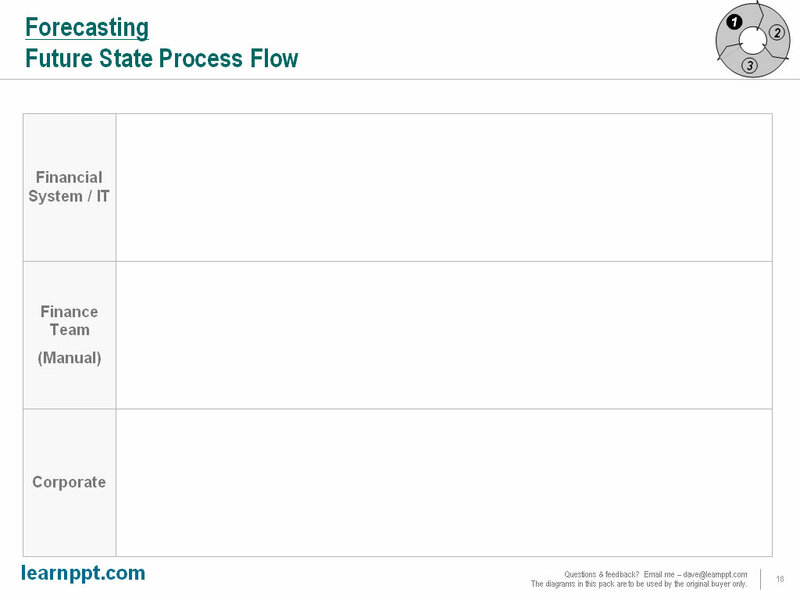 Let’s take a look at the second iteration of our slide. Notice at the bottom of the table, I’ve added 2 lines related to the budget. The first are the marketing expenses. The second is a status box to check whether the vertical stream of initiatives is on budget or exceeds budget. I have color coded this status box, so the audience can very easily identify the status. Depending on what you want your core message to be on the slide, you may want to emphasize the marketing budget portion of the slide. If you have a stream exceeding the budget, you can further highlight it on your slide using a call-out box and different colors. Here’s an example. The slide shown above can be downloaded here. To maintain consistency and flow through your presentation from slide to slide, I like to use Trackers. Trackers are small diagrams (usually placed on the top-right of a slide) that help your audience ‘track’ where you are in your discussion relative to an earlier slide. 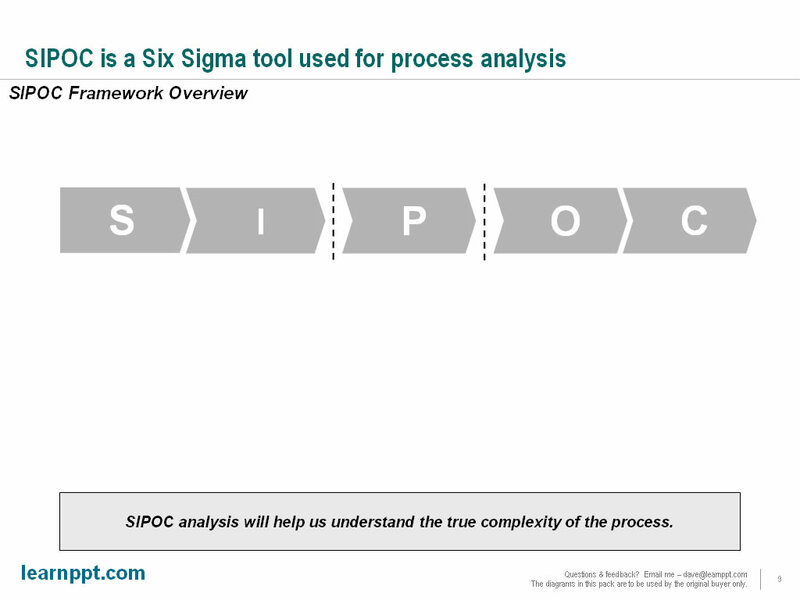 For instance, if you’ve introduced the concept of a 6-phase approach, your Tracker is used to signify what phase in the approach your current slide pertains to. I always try to create diagrams that can easily be leveraged as Trackers. 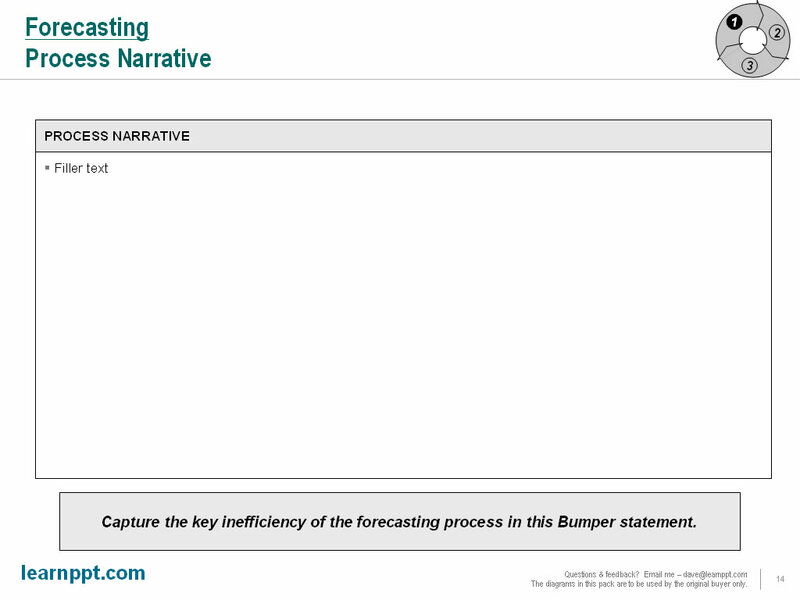 In the slide we just created, the Marketing Strategy chevron can be made into a tracker. Take a look below. Again, the slides created for this tutorial can be downloaded here.